More than three million rental bikes have been placed on Chinese streets. Bike companies are scrambling for market share. A BOOMING RENTAL bike business has flooded China’s streets with packs of cyclists, but their habit of going the wrong way and abandoning their rides anywhere is causing havoc. The authorities, scrambling to catch up, are considering new regulations to curb the chaos — from capping the number of bikes to even barring people they consider too big or too small for bicycles. Unlike the docking station systems in many cities, the bikes in China can essentially be found and left anywhere. Once the ride’s over, they simply park the bike and apply the lock. But many simply leave the bikes in the middle of sidewalks or abandon them haphazardly on freeways. The rules that do exist, are often ignored. This has culminated in fatal accidents in recent months, including the death of a child, spurring officials into action. In recent weeks, police around the country have impounded thousands of bikes that were discarded in piles. But companies plan to put thousands more on the streets. “I like the convenience of cycling instead of taking the subway, but the system backfires when the sheer amount of bikes causes traffic jams in some areas,” 21-year-old Beijing student Zhang Wei told AFP. Many people also don’t know how to bike very well and it is annoying when they swerve around or cycle in the wrong direction. Some 30 different providers wrestling for market share have placed more than three million bikes on streets around the country, according to state media. There were 18.9 million users of shared bicycles nationwide in 2016 and that number is expected to rise to 50 million by the end of this year. With the patience of police and pedestrians wearing thin, some firms have appointed staff to patrol streets. Wearing armbands or neon vests, they stack bikes onto motorised trolleys to move them to places they are more likely to be used. But the startups, including leading rivals Mobike and Ofo, may soon need to comply with stricter regulations. Beijing plans to limit the total number of shared bikes that can be on the streets. 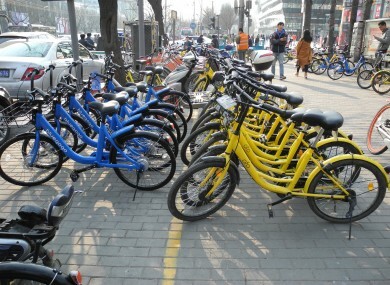 The lively Dongcheng district is aiming to create hundreds of dedicated parking spots that bike rental firms would help manage, according to the state-owned Legal Daily. The city of Shanghai is considering a more drastic approach to limit their use: Barring people authorities consider either too tall, too short or too overweight to hop on a bike due to fears they may be unstable on vehicles made for the average frame. China’s Ministry of Transport has released a draft proposal on rules requiring local governments to better manage the booming bike-share industry. It calls for the development of dedicated parking zones near major transportation hubs, shopping areas and office blocks, and advises local authorities to make some areas off-limits for bike parking. It would also forbid children under 12 from riding shared bikes. “I doubt the police will continue gathering thousands of bikes and putting them in lots,” Towson told AFP. The growing scrutiny partly stems from recent accidents, including the first fatal collision involving a rental bike in March, when an 11-year-old boy died after a bus struck his Ofo bike at a busy Shanghai intersection. A month later in southern Fuzhou, a car killed a woman with such force that her bike shattered into pieces. Road laws in China already ban children under age 12 from riding on public roads, but state media reports say children are frequently seen riding the colourful bikes to school. Email “China is clamping down on bike rentals due to on-street 'chaos'”. Feedback on “China is clamping down on bike rentals due to on-street 'chaos'”.